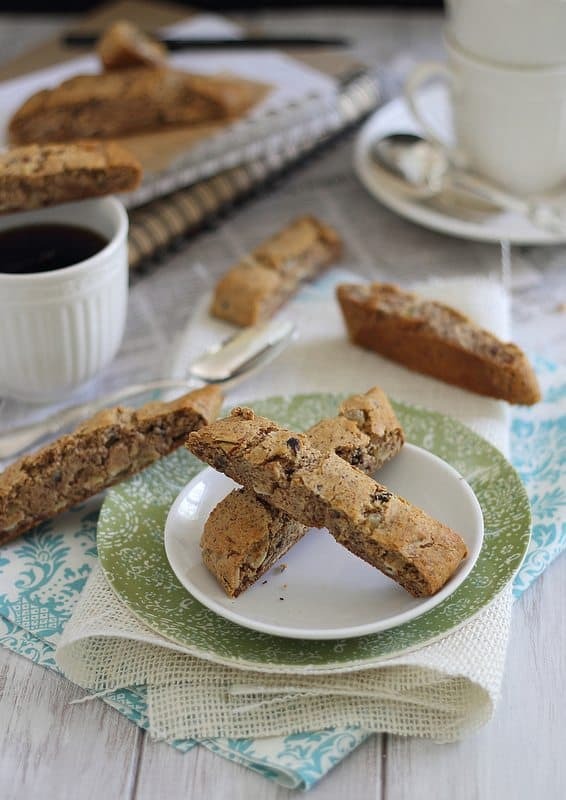 These ginger almond biscotti have a hint of ginger and chocolate in them and are paleo, grain & gluten free. These pictures are what I want my mornings to be. 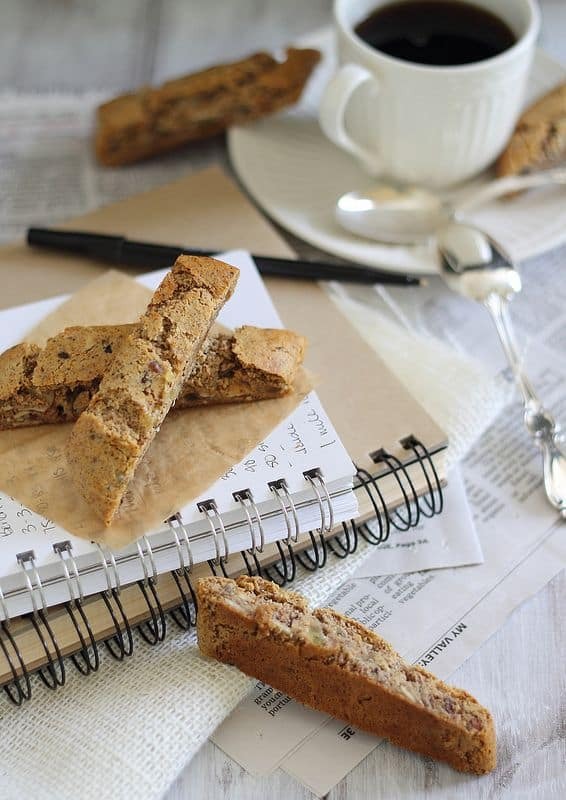 Biscotti for breakfast, cute little white mugs, pretty fabric napkins, a leisurely gander through the newspaper and musings in a spiral notebook. In reality, I eat eggs & bacon for breakfast in front of my computer with coffee in the biggest mug I can find (which also happens to be the ugliest one), read things on the internet and jot down notes on blue post-its all over my desk. So this picturesque morning may be a bit like wishing for the obsolete, but the one thing I can make happen is the breakfast part. Nothing wrong with cookies for breakfast. Especially these as they’re practically begging to be dipped into your morning cup of coffee. They’re just barely sweet with the perfect crunchy exterior biscotti shell and studded with ginger, almonds & cacao nibs to keep your mouth intrigued with each bite. And I promise they taste just as good laying on top of a ginormous 10+ year old snowman mug too. Paleo, gluten & grain free almond biscotti with ginger & cacao nibs. Carefully slice log into diagonal slices (you'll get about 10-12), turn them on their side and bake again at 275 degrees for 10 minutes. Yum these look really good! I need to get some almond flour, ASAP! Beautiful. My morning is like yours…I’m currently sitting in my sweaty workout clothes drinking a huge mug of coffee. The mug has a picture of myself circa 1995 on it. It’s so not cute. I think I’d like to live inside one of these photos instead. i feel same way about my morning – it would be nice to leaf through newspaper and drink from a fancy cup instead of Styrofoam ones. these look great! i love the ginger/almond combination. I just got so excited because I actually have all of those ingredients on hand right now… YUM! does the half tablespoon of starch really do anything? what is its purpose in the recipe? thanks! and thanks for the recipe! you could probably leave it out and just add a bit more flour. It helps bind the flour together as nut flours are a bit different from regular flours in that respect. Ooh, I haven’t made biscotti in years. It looks delicious. G’day! I LOVE biscotti, TRUE! Wow these look amazing! I love biscotti, it’s the best snack ever. Here is a recipe for cranberry and pistachio biscotti you might like to try. Great recipe! Do you happen to have the nutritional analysis for the biscotti? I don’t, sorry. There are plenty of sites online you could plug the ingredients into to find out though. Gina, I LOVE this recipe! So much that I’m featuring on my next blog post! Thanks for the deliciousness! 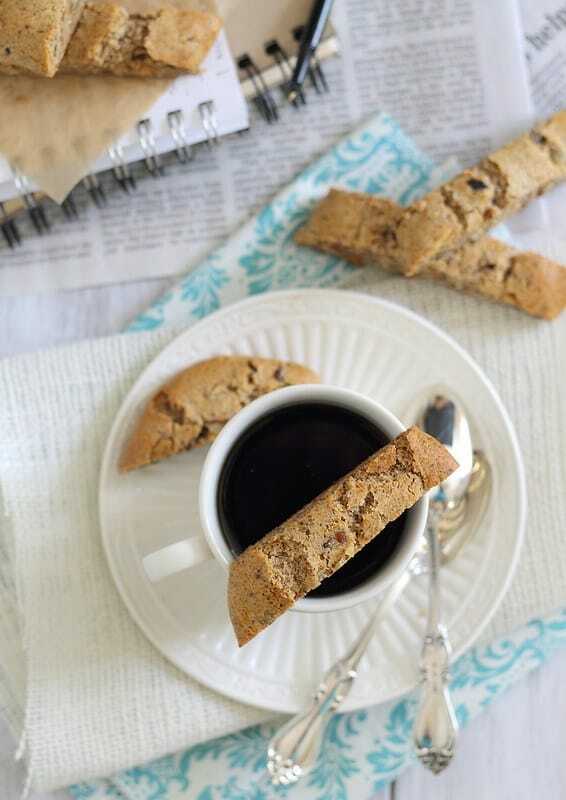 This recipe was amazing…was looking for a simple grain and egg free biscotti recipe and this will be my go-to choice! I substituted chocolate chips and dried cherries, but I’m sure the options are endless with a great base recipe like this. Thanks! Thank you this might be a nice idea to bag and gift for neighbours and friends for Christmas. I came from the cluckers in the chicken coop and am pleased to connect and pin this delish morsel ???? They’re a great edible treat for the holidays, enjoy!